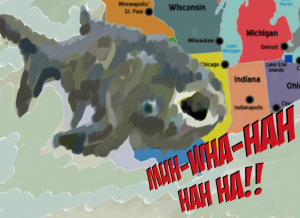 The Mississippi River watershed a post-aCARPalypse world, the Great Lakes fear Carpmageddon! (slang, video games, strategy games) To attack an opponent with a large swarm of units before they have been able to build sufficient defenses. From the game StarCraft (1998), in which the easily mass-produced Zerg units encourage such a strategy. Think how overwhelming the zerg rush of carp must be now, 15 years after that study! Like most invasive species, and old monster movies, the monster was created (the alien invader carp introduced) via man’s folly and ignorance of potential unintended consequences. Asian carp, being super aggressive bottom-feeders, were imported to om-nom U.S. fish farms clean beginning in the 1970s, but with seasonal flooding chauffeuring fish over barriers, it was only a matter of time before the Asian carp escaped sequestered aquaculture and swarmed the natural freshwater ecosystems nearby! Bighead and silver carp have been the most problematic of the invasive Asian carp species in the U.S., filtering plankton from the water, robbing native species of food and living space. And because of their bottom-feeding habits, they are difficult to catch with normal angling methods, so obvious counter-measures (giant fish fry) have been ineffective, though fishing efforts continue …the Natural Resources Defense Council has its Eat An Invasive Today! campaign. stop or slow the spread of one-fish-group supremacy (ecosystems becoming carp monocultures or carptocracies) has led to lawsuits by the upstream states and other parties who have LOTS to lose economically if/when the carp wave crashes into their ecosystems and wipes out biodiversity, wrecks local fisheries, implodes fishing economies and the dollars from angler tourism, fishing tournaments and all the fishermen there due to rich supplies of diverse indigenous fish would be gone. The upstream states, especially the Great Lakes states so dependent on their native fish species, have understandably been pushing hard for the pertinent agencies to build defenses to protect the Lakes, specifically advocating “complete hydrological separation” of the Great Lakes and the Mississippi River basin AKA closing the key link to Lake Michigan, the Chicago Area Waterway System (CAWS). Michigan, Minnesota, Ohio, Pennsylvania, Wisconsin, and affected indigenous tribes, all bordering the Great Lakes, filed a lawsuit against the U.S. Army Corps of Engineers who are responsible for building defenses and the Metropolitan Water Reclamation District of Greater Chicago who own the CAWS. In the Asian carp I case, the Seventh Circuit Court of Appeals in Chicago upheld the prior denials of the pro-hydrological separation states’ claim vs. the CAWS operators and Army Corps of Engineers. But while rejecting the plaintiffs’ claim because it held that the CAWS was being operated in a sufficiently anti-carp manner, the Court nonetheless ruled against the federales’ claim of sovereign immunity and their argument that federal agencies could never create a public nuisance because they have something like the “divine right of kings” and therefore automatically serve the public good. The three judge panel acknowledged that the Corps acts on Congress’ orders but refused to immunize them from future public nuisance liability. July 14, 2014, the Seventh Circuit Court ruled again on the suit against the Corps of Engineers and CAWS operators in what’s being called the Asian carp II case. In this court opinion, the Appeals panel again upheld earlier denials of the Great Lakes states’ plea because of actively ongoing efforts to prevent the carp from getting through the CAWS. But the Court also (finally) ruled on the legal question of “public nuisance” definitively, holding that YES, federal agencies can create a “public nuisance.” I’m not entirely clear on the exact definition and limits of “public nuisance” in its legal sense as used here, but this concept could be an important precedent on which future cases might be built. As someone who was once a plaintiff against the state, I understand that the precedent of the federal gov’t itself causing nuisances and being held liable could be super important, though theoretical here. The Seventh Circuit also rejected the feds’ rather… unique argument that the nuisance was solely carp “acting of their own accord,” and not their fault. That concept of carp as legal actors brought oddities like “Our decision does not depend on the fact that the Asian carp are advancing upstream of their own volition,” into it, not the sort of phrase that one would normally find in a federal court decision. Ultimately, the Seventh Circuit Court of Appeals’ opinion in Asian carp II reiterated the previous rulings’ reasoning that the gov’t is doing enough to halt the carp from devastating the Great Lakes, but wholly rejected blaming the carp alone. “It is the defendants’ apparent diligence, rather than their claimed helplessness, that is key to our holding today…” the ruling stated. Competing interests are definitely the biggest barrier to a carp barrier, as shutting down the CAWS would upset the movement of millions of tons of vital shipments of iron ore, coal, grain and other cargo, totaling more than $1.5 billion a year, and contribute to the loss of thousands, perhaps bajillions of jobs. The Chamber of Commerce weighed in with an amicus brief against closing the CAWS, and of course Chicago and the region doesn’t want it closed. Narrower interests than this have blocked action. The whole Chicagoland regional economy is a heavy player here with lots of clout. that’s a lot of carp. Silver carp have special abilities like super-jumping, and in 2010 a kayaker in a race on the Missouri River was hit upside the head by a 20-30 pound jumping carp, knocking him out of the race. But on the pro-hydrological separation side, there are five other Great Lakes states + the province of Ontario, and Indian tribes, and they have clout too and probably stand to lose even more economically, bazillions in income and countless jobs of multi-state economies, than the pro-defendant interests do if the carpocalypse wipes out the Great Lakes ecosystems. Economic impact on one or both sides of the dispute is a certainty because of inaction instead of action on the issue of invasive Asian carp in prior decades! when there are competing interests, who decides? if the Judicial branch can’t force a decision on long-view ecological crises, who can? what is the proper presidential role in the event of invasive species catastrophes? why do none of the legislative solutions proposed in Congress pass? At this late date, the CAWS may be a moot point as carp babies are evidently immune to the electric barriers and the carp have established footholds beyond the canal. But the challenge of Asian carp and other invasive species, and the larger issue of good environmental stewardship and protecting our communities from toxins, won’t be going away. Final ep in the documentary mini-series Constitution USA – exploring the carpocalypse and other challenges to our constitutional system of divided powers. 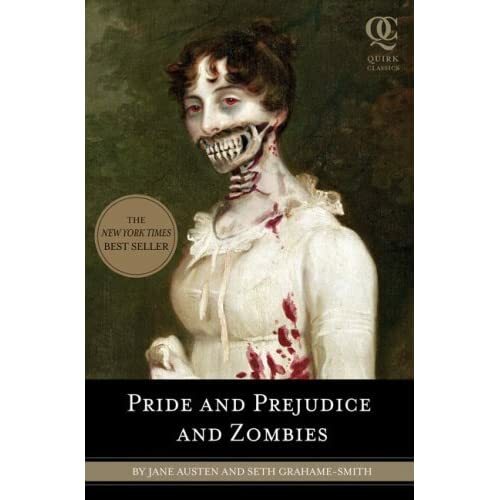 Jane Austen, Now With Ultraviolent Zombie Mayhem! I like Barack Obama; I voted for him because I wanted a fresh start beyond the stale 1960s debates, Olbermann vs. O’Reilly daily “hot button issue” and endless socialism vs. capitalism rock ‘em-sock ‘em robots that lead us nowhere and accomplish nothing. We can’t afford that crap in times like these. And I wanted a serious overhaul of the health care system (Obama’s opponent pledged not to touch the employer-based health insurance concept that’s been hurting us for so long). I don’t consider most of the right-wing criticism of Obama to be very valid, but I do have my list of beefs with Obama, like the lame inaction over Darfur, ignoring the previous administration’s illegal acts, denying due process to prisoners, and more. I’m also deeply skeptical of Obama’s Afghanistan plan (as I discussed here). But something else disturbs me that is rarely mentioned: the problem of too many cooks. Obama is adding a “czar” for every occasion, and new offices for many of the czars. It’s making an already overly complex and large bureaucracy even moreso, and leaving the system even more byzantine for successor governments. Ridiculous bureaucracy, of which I am an (all too familiar) opponent, is dubbed “byzantine” because of what happened to the Byzantine Empire, with its enormous and complicated legal codes only understood by a cadre of royal bureaucrats. When the law is only understood by the few, that breeds corruption. When government is too huge and complex to be easily accessed by the public, it, paradoxically, reduces government’s functioning and power. The Byzantine Empire, actually a great milestone in cultural and administrative achievement, collapsed when it became too weakened by its own complexity and corruption to resist invaders (though there’s a lot more to it). I don’t want the U.S. government to be “byzantine.” Clinton tried fixing some of this with his “Reinventing Government” initiative (he usually gets no cred for this). They really did reduce some government forms from 30+ pages to 1 page, disbanded Reagan’s personal furniture maker and bought from Office Depot instead, and “cut the fat” from a lot of departments. They didn’t make much headway on consolidating and downsizing agencies like they wanted to, because of fierce resistance from bureaucrats prepared to defend their jobs Thermopylae-style, and they were occupied by other things (subpoenas for the White House xmas card list, etc.) I would like to see “Reinventing Government” on steroids…radically streamlining federal agencies and attacking waste. I want Obama to use an iron fist to override administrators defending their sacred bureaucratic turf, and radically consolidate our insanely duplicative, bloated bureaucracy. Dept. of Treasury and Dept. of Commerce should be one agency, for example. The Dept. of Homeland Security (Bush’s massive expansion of government) should be abolished and whatever is actually useful within it would be consolidated into the FBI and other existing agencies. Aside from the fact that a parade of “czars” in the White House may make the vehemently anti-monarchist Founding Fathers rise from their graves in a rage, triggering the much anticipated zombie apocalypse, there are serious concerns that “czars” greatly reduce transparency and consolidate power in the White House. My biggest concern is what this monster turns into 10-20 years down the line. Known for their intellect and experience, these appointees could become rivals or advocates of competing ideas that could hinder White House operations if not skillfully coordinated. Obama obviously disagrees. He has signaled plans to name Bronx politician Adolfo Carrion Jr. to a new White House post coordinating urban housing and education policies. And he has named Nancy Killefer to the new job of “chief performance officer,” which oversees many agencies. 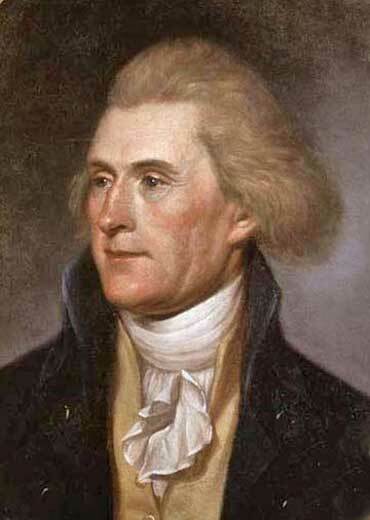 He is hardly the first president to have a close aide coordinating several agencies. For years, a White House-based national security adviser has tried to put together information from the military, State Department and intelligence agencies. But Obama’s creation of new policy czars and special envoys is pushing White House centralization to new levels. Some government veterans say the strategy can help a president shape policy with minimum interference from Cabinet agencies. Under the right circumstances, a White House czar “can cut through some of the interagency disagreements that slow down and clog the policymaking process,” said Bill Galston, a University of Maryland professor and former Clinton White House aide. But the system can be cumbersome, rife with jealousies and hampered by conflicting efforts and messages, Galston said. To make it work, he said, Obama “will have to be a way-above-average president,” which he has the “intellect and temperament” to be. Obama likely has above-average skills. But what about his successors? What will America become?